Naidie arrived with us about 18mo ago "because she's the only cat in the basket with a proper smile, pleeeeeeeeeeeeeeeeeeeeease can we take her home????". 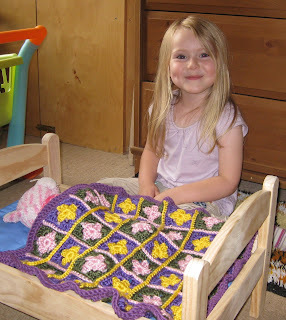 She is utterly beloved, goes everywhere and this weekend gained her own little bed (at least she got one. The grown-ups failed utterly to get a new one for themselves, grumble grumble). It came with a sheet, pillow and mattress, but flush from my granny square swap success, I suggested I make a blanket. Oh my lord. I have a new-found respect for people who make large afghans! The actual squares are only two rounds with a big hook, so they were quick to do, but what a faff to darn in all those ends and sew it all together! I had just one ball of each yarn - freebies from the front of a magazine - so it was touch and go as to whether I'd have enough to finish it. That explains the somewhat ugly seams; I ended up using a half-ball of Debbie Bliss cotton angora to do the border. But hey - it fits the bed and my little lady is happy. Ugly is in the eye of the beholder, and a squashy, bedraggled pink-and-white cat called Naidie loves it (so I'm told). Job done. I think it's really gorgeous, so clearly, like me, you have the critical eyes when it comes to your own makings! The kitty and her owner are cute too! That is too adorable! 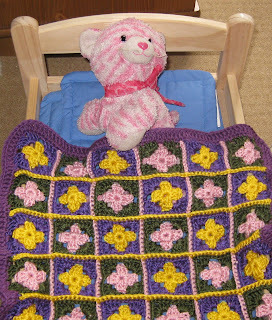 I can't believe you made a blanket for kitty, you are such a softie :) K is really growing isn't she. She has lovely hair, so long I can't believe how quickly time passes. Lol, Rhinoa - for Xmas I made Naidie and another cat both scarves and Monkey got a hat; they had their own little stocking. K was absolutely thrilled. Course, now I have to come up with more gifts for toys this Xmas...! Your daughter is so super cute! That photo is gorgeous. The blanket and kitty are super cute too.